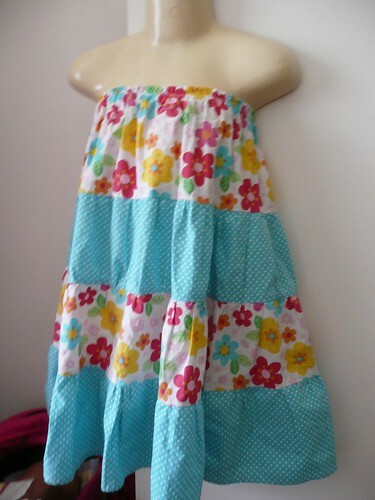 I must admit, now that I have started to make little girls clothes, I am quite addicted. Let's face it really, I had best make the most of it now as I am sure in a few years there is no way Emily will want to be seen dead in something that Mum has made ! Right now, however, I am up there on my Mummy The Sewing Goddess Pedestal. ( the fall down will be hard ! ) . Squeals of delight are forthcoming upon the completion of each item and well, thought she would pop a vein over this twirly layered skirt when she tried it on. Little devil was not going to stand still for a photo though, so hence I have pulled out the torso plastic dummy. 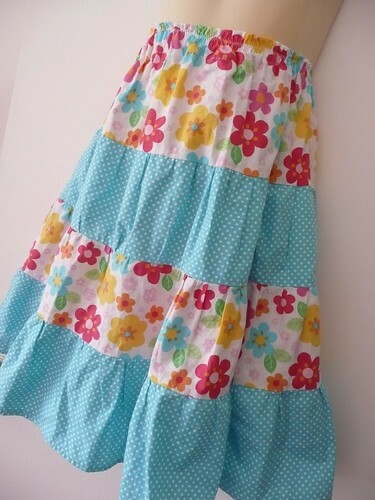 The beauty of this style is the fact it can be made as a dress for a 2 yr old toddler ( just add shoestring straps ) or fits as a skirt for a 4yr old. I followed the pattern formula on this link at J Caroline Creative. You will just need to adjust your measurements to suit. Make one for yourself while you are at it ! Oooh. That skirt is gorgeous. i'm definately going to make one for my daughter. Thanks! Sure is gorgeous. Way to go super mum! Oh yes my daughter is 12 the fall is very very hard , lol ! Enjoy it while you can , your daughter sure will and why wouldn't she that is a wonderful skirt . Love the skirt and the new name. Love it! Love the colour and pattern combos and the dress to skirt thing. Yay for Emily's Mum! oh nice! I love making my Jem things- so much easier than boy stuff.. poor Caleb. I have a few skirts like that that have become a little small for me, perhaps I should make one for me... J really doesn't need anything at the moment! multiple personality disorder ? !